It’s no secret Good Smile Company has been thinking more globally these days. Aside from opening up an International online shop, they’ve been appearing at cons like Anime Expo and even hired “Mamitan”, company spokeswoman Mikatan’s English language counterpart. So when the news hit that GSC would be bringing a full booth to this year’s New York Comic Con, it wasn’t a terrible shock. Even if it wasn’t much of as surprise though, the fact that GSC would be in the U.S. with figures on display and selling exclusives is big news for the figure community. I had the opportunity to go and visit their NYCC booth and I have to say I was impressed. Their showing was modest but substantial, and I’m sure it will pave the way for potentially bigger plans in the future. 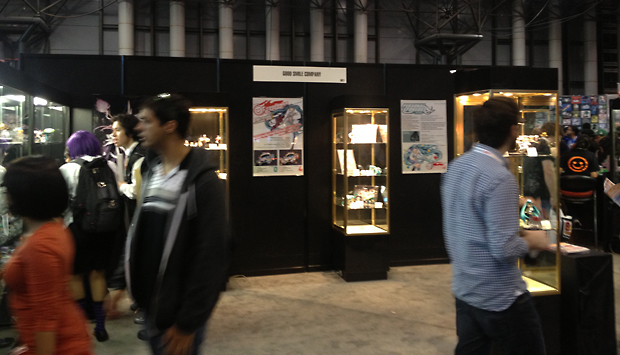 I find it interesting that GSC chose to make their debut at NYCC. Formerly the home of the New York Anime Festival, the con has lost a lot of its anime related presence over the past few years. After seeing the booth myself however, it looks like it works in this situation. Located in quieter territory with the other designer toy companies, they’re able to test the waters without the pressure or expense of a big show floor production. If all goes well then maybe we’ll seem them in the future at more anime-centric cons like Anime Expo or Otakon. 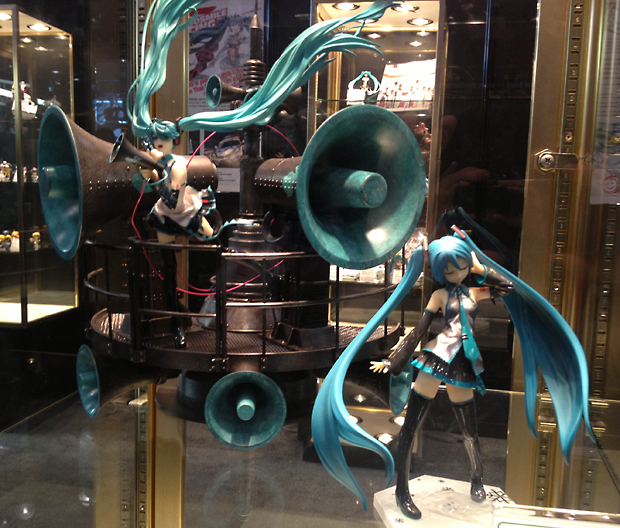 That’s not to say they GSC didn’t bring the goods however. On display they had just about EVERY nendoroid that has ever been released. That’s over 250 nendos, not even counting the petits. This was a really smart decision. 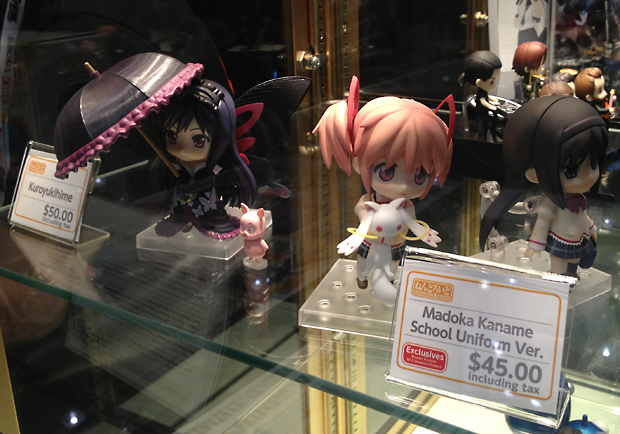 The majority of people approaching the displays would often spot one of their favorite anime characters, but had never seen a nendoroid before. Well you know what? Not only do they know now, but they also get to see how this is an ongoing line they could purchase from in the future. Reactions to the toys were overwhelmingly positive as well. 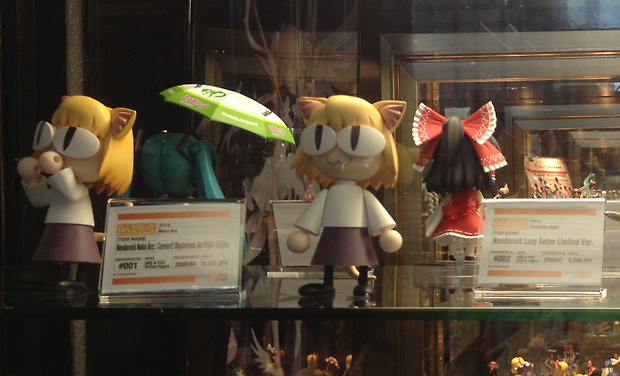 Given the exceptional quality of each nendoroid, no surprise there. GSC also came with a whole flyer’s worth of past exclusives and other popular items in tow, all for sale at reasonable prices. 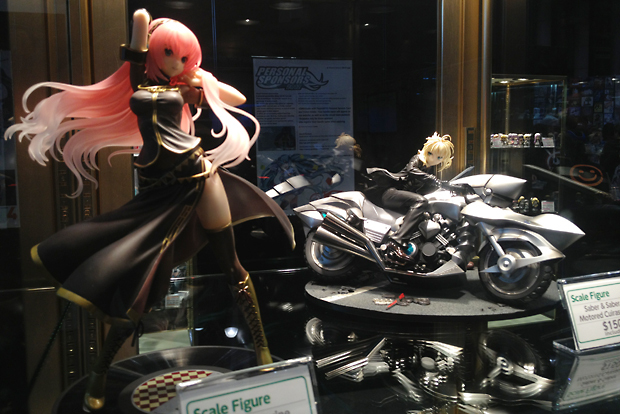 In addition to nendos and figmas, they brought some of their most impressive recent scale figures including Fate/Zero Saber, “Love Is War” Hatsune Miku and Tony Taka’s version of Megurine Luka. Miku just about sold out the first day, and I saw quite a few of their awesome day glow orange reusable shopping bags floating around the show floor. So from my completely informal observations, they seemed to be doing pretty well. Aside from getting to see all the figures on hand and have a chance to pick up one myself, I think the coolest thing for me was hearing people’s reactions when they saw the booth. Like I mentioned before, many of those passing by were not aware these things existed. I can’t say I’ve ever really experienced seeing that sense of wonder when an anime or gaming fan discovers that people make these really cool toys out of the things that they love. I got to see that a couple times today and it was a good feeling. I’m sure the friendly staff at the GSC booth noticed as well, so here’s hoping for even bigger and better appearances in the future. Maybe even some exclusives of our own? We’ll have to wait and see on that, but in the meantime if you’re in the New York City area I’d recommend you head on over to NYCC this weekend and check out the booth for yourself.